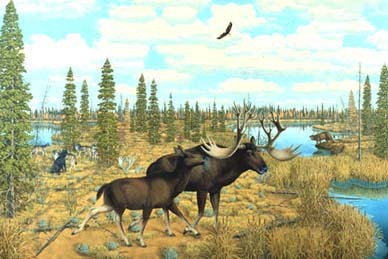 Ancient Forests is about Illinois forests and the last Ice Age. The time period covered is the late Wisconsin, from about 30,000 years ago, when the ice of the last glacier (called the Wisconsin Glaciation) arrived in Illinois, to about 17,000 years ago, when the ice was gone. (see timeline). Today scientists can reconstruct ancient forests by studying pollen from trees and other plants that has been preserved in lake sediments (muds) and in peat. They can describe the changing forests and landscapes of Illinois for periods of time stretching from tens of thousands of years ago to the present. This section looks at the results of a pollen study at Nelson Lake in northern Illinois and from other sites in different parts of the state. There is also a classroom activity on pollen graph interpretation.